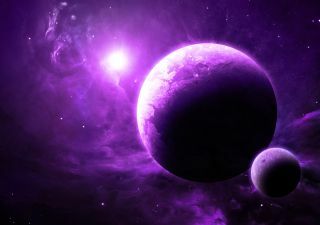 Extraterrestrial life may use purple pigments to harvest energy. Alien life might be purple. That's the conclusion of a new research paper that suggests that the first life on Earth might have had a lavender hue. In the International Journal of Astrobiology, microbiologist Shiladitya DasSarma of the University of Maryland School of Medicine and postdoctoral researcher Edward Schwieterman at the University of California, Riverside, argue that before green plants started harnessing the power of the sun for energy, tiny purple organisms figured out a way to do the same. Alien life could be thriving in the same way, DasSarma said. The idea that the early Earth was purple is not new, DasSarma and his colleagues advanced the theory in 2007. The thinking goes like this: Plants and photosynthesizing algae use chlorophyll to absorb energy from the sun, but they don't absorb green light. That's odd, because green light is energy-rich. Perhaps, DasSarma and his colleagues reasoned, something else was already using that part of the spectrum when chlorophyll photosynthesizers evolved. That "something else" would be simple organisms that captured solar energy with a molecule called retinal. Retinal pigments absorb green light best. They're not as efficient as chlorophylls in capturing solar energy, but they are simpler, the researchers wrote in their new paper published Oct. 11. Retinal light-harvesting is still widespread today among bacteria and the single-celled organisms called Archaea. These purple organisms have been discovered everywhere from the oceans to the Antarctic Dry Valley to the surfaces of leaves, Schwieterman told Live Science. Retinal pigments are also found in the visual system of more complex animals. The appearance of the pigments across many living organisms hints that they may have evolved very early on, in ancestors common to many branches of the tree of life, the researchers wrote. There is even some evidence that modern purple-pigmented salt-loving organisms called halophiles might be related to some of the earliest life on Earth, which thrived around methane vents in the ocean, Schwieterman said. Regardless of whether the first life on Earth was purple, it's clear that lavender life suits some organisms just fine, Schwieterman and DasSarma argue in their new paper. That means that alien life could be using the same strategy. And if alien life is using retinal pigments to capture energy, astrobiologists will find them only by looking for particular light signatures, they wrote. Chlorophyll, Schwieterman said, absorbs mostly red and blue light. But the spectrum reflected from a plant-covered planet displays what astrobiologists call a "vegetation red edge." This "red edge" is a sudden change in the reflection of light at the near-infrared part of the spectrum, where plants suddenly stop absorbing red wavelengths and start reflecting them away. Retinal-based photosynthesizers, on the other hand, have a "green edge," Schwieterman said. They absorb light up to the green portion of the spectrum, and then start reflecting longer wavelengths away. Astrobiologists have long been intrigued by the possibility of detecting extraterrestrial life by detecting the "red edge," Schwieterman said, but they may need to consider searching for the "green edge," too. "If these organisms were present in sufficient densities on an exoplanet, those reflection properties would be imprinted on that planet's reflected light spectrum," he said.